Published: . Filed Under: gender, HerStories. 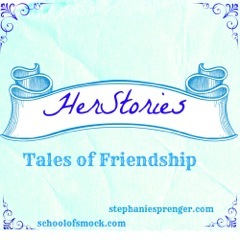 We would like to introduce you to HerStories: Tales of Friendship. In this series, we hope to document women’s friendships in every shape and form. Childhood friendships, lasting friendships, brief friendships. Friends bonded by motherhood, by school experiences, by common interests, by personality, and by convenience. The friend who helped you through a tragedy, the one who let you down. The friend that you partied all night with, the one who held your hand when you cried. We want you to tell us about a friend that shaped your life. We know that women often mark time and remember their lives not only by the places they lived, the schools they attended, the births of their children, or the professional milestones they reached. They also remember their lives through the lens of friendship. Stephanie starts the series, with a story about her friend, Erica. Please go to Stephanie’s blog and read her story of their friendship. Please contact us at herstoriesfriendshiptales@gmail.com with any questions or ideas you may have. We would love to hear your story. If you would like to contribute to the series, please send us an essay of approximately 500-1000 words as well as a 2-3 sentence bio. I am very moved by what you proposing to curate…stories/facts/life changing friendships between women. I am a 48 year old mother of two girls who has had remarkable female relationships throughout my life. One example is that in college I lived all four years with the same 5 women…not something that happens often in college & we are still close. I now have a hiking group, we call ourselves the GOATS, whom inspire, encourage, challenge & make me laugh so hard it hurts. I would be honored to add one of my stories of a real life friendship to your wonderful concept. I am a new blogger, but you can read enough of my writing to see whether you would be interested by visiting http://www.mysoulfulhome.com. Jessica recently posted…Do Homeschooling Moms Show the Paradoxes of Modern Motherhood? Jessica…thank you so very much! You have given me a great boost of confidence with your kind words. I found you late last night so I am eager to explore your site more over this weekend. Obviously, I am impressed by what you are doing/sharing as well! It is with great pleasure that I embark on an attempt to put into words the bond I have with my GOATS. It is special indeed…As soon as it is ready I will contact you. I hope to see you here at My Soulful Home & I will see you at School of Smock before then.